New to managing staff? Don’t get caught out! We often write articles for those who are already experienced in HR, but increasingly we have been asked to write guidance for those who are new to managing staff. If this isn’t you, no need to read on unless you have a new supervisor or line manager who could benefit from you passing this on. If you are a new manager, without much prior understanding or knowledge of what is required, this can be dangerous territory especially if no support in the form of training or coaching is available. So, in order to set you on the right path let’s take a look at a few of the legal essentials that are taken from our one-day training course ‘Hearing the Warning Bells’. Ignore these legal essentials at your peril as tribunal claims are currently soaring. Is your Company or HR Function issuing the right paperwork and keeping things on the straight and narrow and are you, as manager, aware of what should have been issued and what needs to be managed? The legal penalty for failure to issue contracts within the eight weeks (which is a loss of a statutory right) is between £300 to £400. Employees have the right not to have to work more than 48 hours per week (including overtime). If you want employees to work more than this, you’ll need to ask them to sign an opt-out form. Send it out with the contract when they first join you. There is no obligation for them to sign if they don’t want to. If they do sign an opt-out form, they can also provide you with notice to sign out of the opt-out. When workloads are unexpectedly high and staff are working more hours than they usually do, be aware – perhaps last month the opt-out was irrelevant but this month it is relevant and it is needed! The same goes if all of a sudden you have one employee who is continually asking for overtime. Perhaps they have personal financial challenges prompting them to start asking for extra hours. Check back to see if they ever signed the opt out. Just because they didn’t when the started with you does not mean you cannot ask them to sign it now. If employees are working excessive hours they can suffer from ‘burn out’ and will go off from work as unfit as a result. It is, therefore, best practice to keep an eye on employees’ working hours. 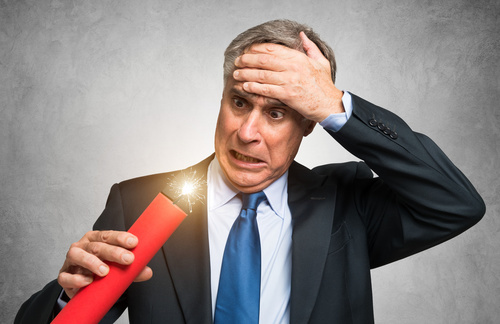 If an employee is dismissed because of behaviour that can be linked to ‘burn out’ and they have been working more than 48hrs pw without having an opt-out on file, then the legal penalty could be an unfair dismissal claim. The average compensatory award for an unfair dismissal claim is £16,543 – see the Tribunal stats at the bottom of this page. Employees have the right to receive minimum wage, they shouldn’t have to ask for it or suffer not receiving it in this day and age. Just a few days ago, almost 240 companies have been ‘named and shamed’ by the Government for failing to pay minimum wage and this included several recruitment firms, alongside businesses including Card Factory and franchises of Subway and Domino’s Pizza! If you don’t pay minimum wage, you will face fines plus the bill for backpay that your workers will claim from you. Around £1.4 million has been recovered in back pay for 22,400 workers, with employers fined almost £2 million with some cases stretching back over 7 years. If your staff, on paper, receive the minimum wage but then due to deductions, fines, additional hours etc. they are not actually being paid at that level, you are breaching the law. Under the General Data Protection Regulations (GDPR), there is a mandatory breach reporting responsibility on all organisations that handle data (under the Data Protection Act it was simply advised, not a legal requirement). If you come out in a rash when people start spouting legal jargon and that doesn’t mean much to you, in plain English it means that if you lose, accidentally disclose, or use data without authorisation then that is a data breach and that breach has to be reported to the Information Commissioner. Your line managers will be dealing with personal and sensitive data all the time so they need to know what their responsibilities are, including what is and is not a data breach. Don’t leave your managers in the dark about what they should be doing. In our experience managers hate feeling ineffectual and defensive because their staff know more about their rights than they do. You will need a breach form in place to record any breaches. Fines for breaching the GDPR are up to 4% of annual worldwide turnover, or EUR 20 million, whichever is greater. In practice, fines will be issued according to a sliding scale and consideration would be given to the nature, gravity and duration of the breach. If you are in breach of the GDPR, the Information Commissioners Office (ICO) will investigate your organisation and look at what training you have given staff, as throughout the Regulations data protection training is recommended. In order to mitigate any breaches, we therefore advise that you train your staff and managers in GDPR. To make this easy and very cost effective, we have developed two GDPR compliant eLearning courses. Ask us for a demo and pricing for either training all your existing staff or adding in data protection eLearning to your induction programme – you can purchase individual licences from our store. Did you know that workers and employees are entitled to a minimum daily rest period of 11 hours uninterrupted rest between finishing work and starting again the next day? There are lots of rules surrounding rest breaks particularly if you have workers aged between 15-18 working for you as they are entitled to longer rest breaks. Failure to provide the legal minimum rest breaks could result in you receiving a constructive unfair dismissal claim – see the Tribunal statistics table at the bottom of this page to find the average compensatory award for an unfair dismissal claim. Employees are entitled to be accompanied at most disciplinary and grievance hearings by a fellow worker or a trade union official of their choice, provided they make a reasonable request to be accompanied. Workers have the right to take paid time off during working hours to accompany fellow workers employed by the same employer to most disciplinary and grievance hearings. As this is a statutory right, failure to allow an employee to be accompanied could result in the formal process being rendered unfair. If an employee is dismissed following these formal hearings, the average compensatory award for an unfair dismissal claim is £16,543. Failure to follow the correct process can result in compensation being uplifted by up to 25%. Can you afford that simply because you forgot to inform them of their right to be accompanied? Employee’s have the right not to be unfairly dismissed and it therefore paramount that for any dismissal, you follow the ACAS Guide on Disciplinaries. Just one small error in not following a fair procedure, could result in you receiving notification from ACAS that you have a claim on your hands. Did you know that you should notify the employee ahead of the disciplinary hearing what the hearing could result in? Either, for example, a first or final written warning or potentially dismissal. Failure to include this small point within a letter that invites your employee to a hearing could result in an unfair dismissal claim. As we have said above, the average compensatory award for an unfair dismissal claim is £16,543. There is a statutory right for an employee to postpone a formal hearing for up to five working days, if the reason for that postponement is due to the employee’s chosen companion being unable to attend the original date. In this case, the right is to postpone the hearing to another time which is reasonable. Don’t let emotions cloud your decision making when deciding what is reasonable or not … its easily done! Equally, when sending out the letter that invites your employee to a formal hearing, don’t have your heart set on the matter being dealt with on that day. Requests to postpone are very frequent so be prepared to be flexible. The legal penalty of pressing ahead with a meeting and not allowing the employee to postpone a hearing is up to two weeks’ pay capped at the statutory weekly capped amount of £508, totalling £1,016. An employee has the right to at least 1 weeks’ notice of dismissal even if they have been employed with you for only a few days. And if you have ever heard of ‘instant dismissal’ get that thought right out of your head! There really is no such thing if you wish to be protected in law. Unless you have very short service staff and a disciplinary procedure that excludes short service staff, ‘instant dismissals’ in the UK take at least 2 weeks to achieve through a number of letters and one or more meetings! An employee who is not given notice they were entitled to would claim for breach of contract. They are only able to make this claim if they are no longer working for you. The Employment Tribunal has the power to compensate for their financial loss, up to a maximum of £25,000. We have barely touched the edges in terms of employees’ statutory rights and managers’ legal obligations, but hopefully it is a starter for ten. If you want more support why not take a look at some of the other HR Blasts we have written such as the one on identifying whether your new starter is employed or self-employed? You can search them here, and you can sign-up to future updates (if you haven’t already) like this one using the same link. Docs Wizard can also provide all the letters you will need as a manager or HR professional to recruit, manage, or dismiss your employees, for just £49 (+VAT) per year. Using the templates will keep you (mostly) on the straight and narrow and ensure that what legally needs to go into a letter, actually goes into it! Check it out now, we know you won’t be disappointed! There is a lot to keep on top of in law so why not let one of our Consultants help you! Our Consultants have extensive experience in managing disciplinaries, grievances, appeals and Tribunal responses, they will be able to ensure that you acting in compliance with statutory requirements and still be able to operate your business in the way that you would like to. Call us on 01425 479888 to find out more and please note that we don’t tie our clients into contracts – if you continue to use us, it’s because you value and like us, not because we’ve legally tied you up in contractual knots! Disclaimer: The information contained within this article is for general guidance only and represents our understanding of employment and associated law and employee relations issues as at the date of publication. Jaluch Limited, or any of its directors or employees, cannot be held responsible for any action or inaction taken in reliance upon the contents. Specific advice should be sought on all individual matters.